Today's weather wasn't much to brag about (warm, muggy, rainy), but I was in Long Lake bringing a kayak to my son Zack, so we took some time to do a few short hikes in the area. 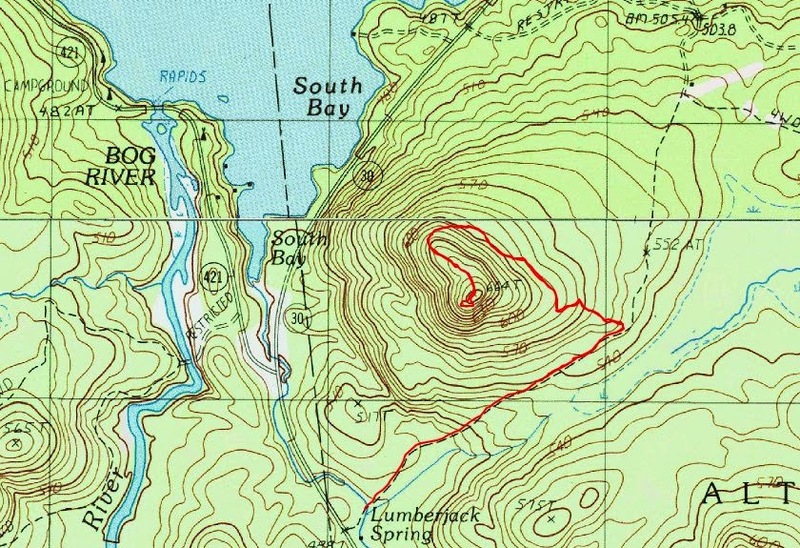 First up was Goodman Mountain (2162') at the southern end of Tupper Lake. This trail was just opened this month by the Department of Environmental Conservation. 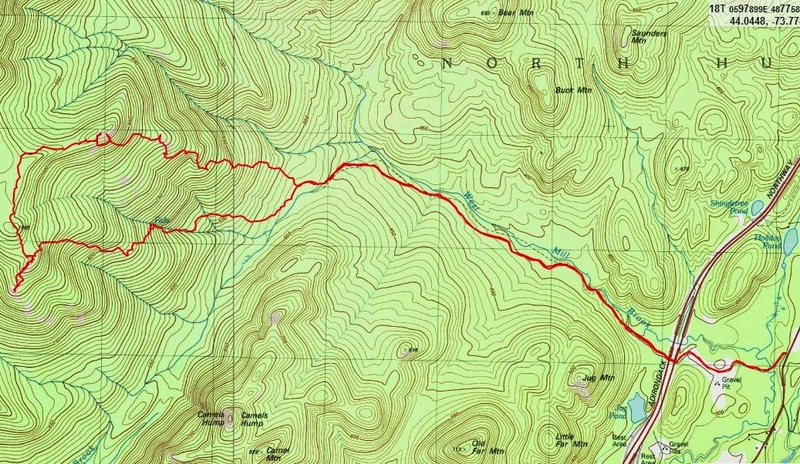 The trail boasts an accessible portion (1400' long) on an old paved road, followed by a moderate grade on the old paved road, and lastly a newly constructed foot path to complete the trek to the summit. The newly constructed trail portion was a moderate grade. Then were a couple slick portions that were muddy due to the rain, but we were on the top after 30 minutes from the time we left the car. The rain stopped just before we reached the summit. We were fortunate to have some visibility. What surprised me was that that was no view of Tupper Lake. It is blocked by trees on the north side of the summit. We wandered around a little, but didn't see a viewpoint looking north. The rain did not return as we descended so we got back to the car mostly dry. 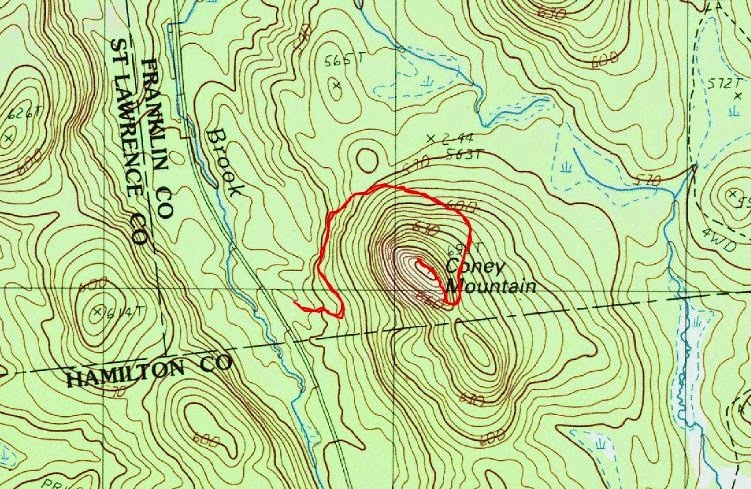 Since Coney Mountain (2267') is located just a couple miles south on Route 30 from Goodman, we headed that way to climb a 2nd small peak. The open rock summit of Coney is visible from several locations on Route 30 on a clear day. I had driven past it many times, but had never stopped to check it out. Coney has a pretty awesome summit, with open rock and 360 degree views. It would be a great place to hang out for awhile on a nice day. Long Lake is visible to the south. We saw hooks remaining in the rock from a weather station or previous﻿ structure that no longer exists. These hikes make for great after work hikes or chances to stretch your legs while passing through. Coney is especially nice and I'm sure I'll do them both again in the future. I guess my theme this weekend was bushwhacking to waterfalls and open rock with views. Saturday was in the Dix Wilderness and today was in the Giant Wilderness. I parked near Chapel Pond at the Zander Scott Ridge Trail for Giant, only instead of taking the trail, I began bushwhacking the right side of the drainage just east of the ridge trail. 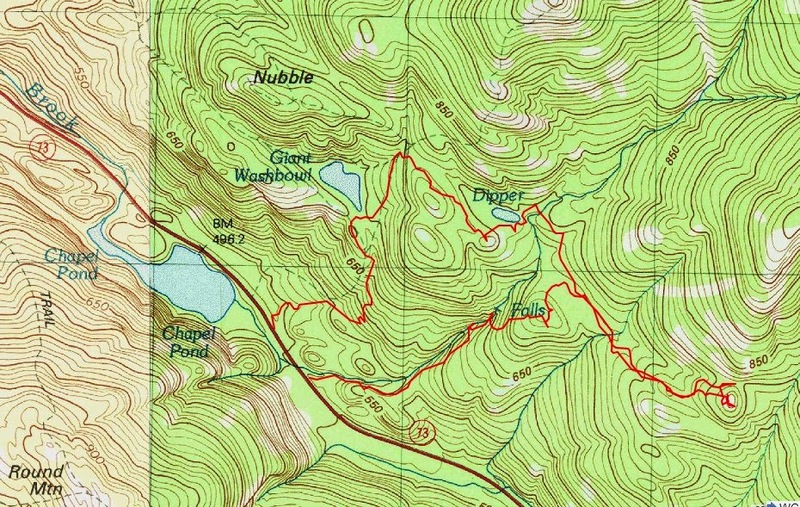 The topo map has a falls labeled that I had not yet taken the time to explore. I encountered a faint herd path on and off. No doubt others had done this same trek. The grade was relatively steep, but the bushwhacking was not a problem. It was a .6 mile hike to the falls, with an elevation gain of about 500 feet. The falls lies in a deep ravine so some care is needed getting down in there. It is worth it. The falls is spectacular and there is a great swimming hole at the base for those that like cold water! It's amazing how remote this spot felt even though it is so close to the road. I posted a video of the falls on You Tube. Look at that grotto to the left of the falls! From the falls, I continued to climb and headed over to some promising open rock which is essentially the southern terminus of the slope to Rocky Peak Ridge. I passed an old abandoned hunter shanty on the way. The southern promontory is comparable to Giant's Nubble and offers excellent views of the Dix Range, Round Mountain and the Great Range. I got lots of great pictures from this location. a mountain goat, or my dog Rev? Rather than bushwhack back the way I came, I decided to go past the Dipper and connect with the Ridge Trail to Descend. 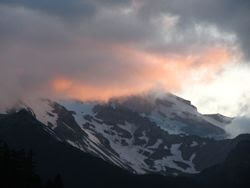 I ran into some horrid blowdown south and west of the Dipper, but it didn't last for long. Once on the trail it was an easy cruise back down. Rev and I passed a dozen or so people on the way out.